Having read and understood Skapes paper on Windows shellcode I thought I'd better provide yet another explanation on how it works. Yesterday I explained finding kernel32.dll so today I will explain Skapes method of resolving symbols inside a dll. 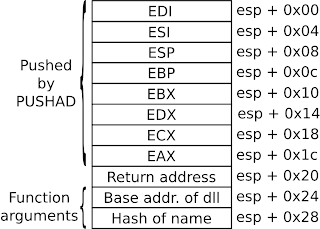 All addresses inside the PE file are relative to the base address...they are NOT absolute. Now EDX contains the absolute address in memory for the IMAGE_EXPORTS_DIRECTORY structure. 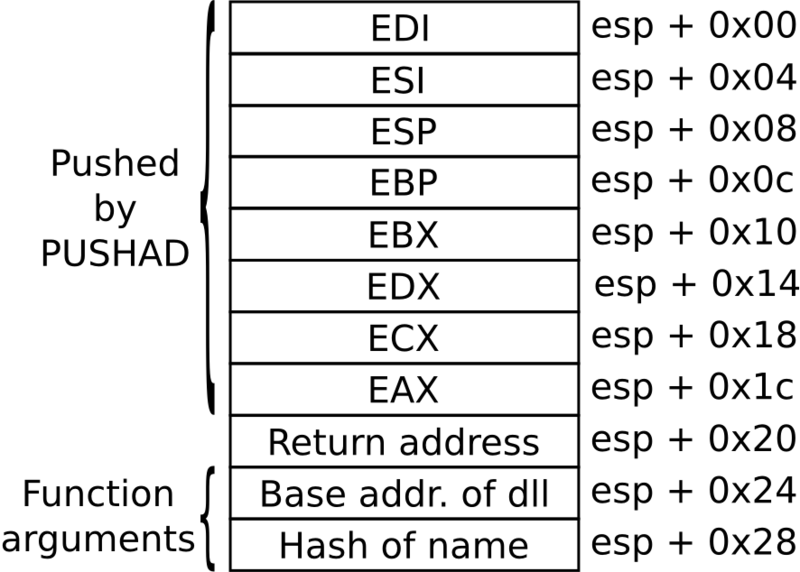 Now ECX contains the number of exported symbols and EBX contains the address of the array of name offsets. Now we enter a loop which iterates backward through all exported names, hashing each name and comparing it to the requested value. test  al, al                 ;Reached end of string ? 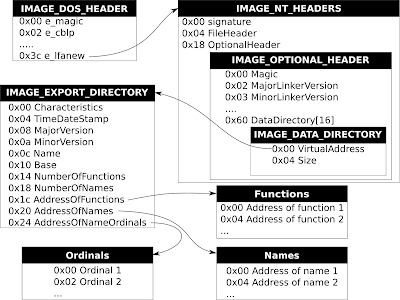 The code is pretty clear when you can visualize the structures. With these two shellcodes you can build more or less anything since you can load any library on the target machine and utilize its functionality. I had hoped to write about how awesome I am or some cool project I am working on, but no. All my projects need code which needs syntax highlighting and I cannot seem to get it working so instead I will write about how badly I am failing at making this work. And there is even lots of integration guides telling you how to make it work on many different blogging sites and CMSes so what can go wrong? Well I succeeded in doing something wrong...it ain't working. But for some reason it didn't work. The code was just shown plain, simple and boring as with a normal <pre>. Why? I press F12 again and run 'SyntaxHighlighter.all();' from the console. Nothing happens! Maybe SyntaxHighlighter doesn't like being called twice so I commented out the 'SyntaxHighlighter.all();' call from the template and ran it again manually. Still nothing! Maybe there is an error in SyntaxHighlighter, so I create a static test page on my machine which loads all the files and contains a code snippet. To my dismay it looks fine and well highlighted. This is where I am now. Failing! Or maybe Blogger is...I really cannot tell but life must go on so I archive this issue in my "technical debt" tray for later. Code snippets will look like crap until I (or someone else) resolve this issue. So much for looking cool in my first post.